Rachel Von | The Journal Gazette Summit City's Hayden Scott moves the puck across the ice during the first period of the Homestead vs. Summit City hockey game at SportONE Parkview Icehouse on Saturday. Rachel Von | The Journal Gazette Summit City's Xavier Schell, left, pushes the puck towards the goal as Homestead's Colin Showler tries to stop his efforts during the second period of the Homestead vs. Summit City hockey game at SportONE Parkview Icehouse on Saturday. 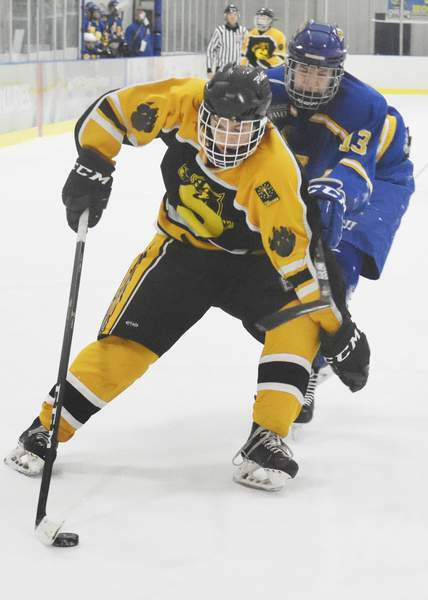 Sophomore goaltender Connor McKinnon had played nearly two minutes of particularly impressive late-game hockey for the Summit City Panthers, propelling them to the Class A state hockey championship, yet he was having trouble describing how exactly it happened. McKinnon can’t be blamed for not remembering what was, quite simply, a barrage of shots that came his way after one of the captains, Jason Marquardt, took a hooking penalty with 1:51 left. It began with a high wobbling shot from the blue line, and that would be the easiest one he’d face. There were two slapshots from the top of the circles, two tricky shots from the corners, three redirections in front, and a powerful shot from the slot. “We’re a defensive team and we gave up two goals in two periods, and that’s not good enough,” Panthers coach Lincoln Kaleigh Schrock said. “Our third period has been our Achilles heel all year and I said, ‘guys listen, if you play one good third period here and we grow as a team, then you guys win a state championship.’ They really did. They buckled down. Homestead, which twice rallied from one-goal deficits, got solid goaltending from freshman Michael Hall, who stopped 16 shots. Summit City had the only goal of the first period when Joseph Hacker skated in from the left circle and snapped a shot into the far side of the net. Just 26 seconds into the second period, the Spartans answered with a shot from 20 feet out by Benjamin Jennett. 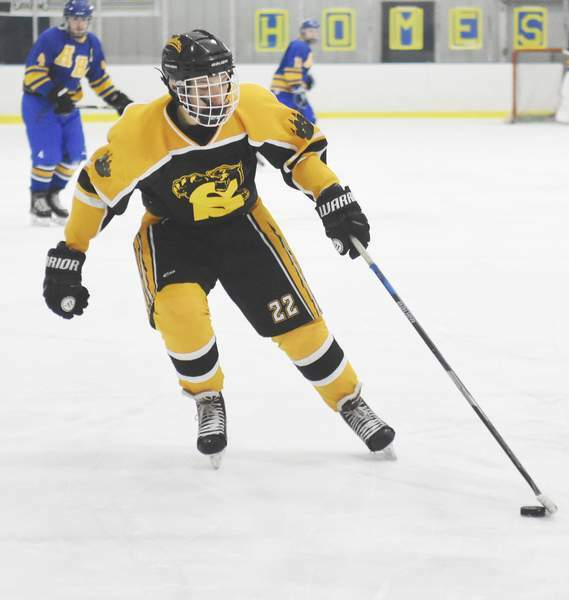 The Panthers atoned during a power play when Trevor McKinnon skated in from the blue line, misfired on a shot, and then put his second attempt into the bottom of the net for a 2-1 lead. Homestead’s Keaton Coulter answered 1:37 later on a breakaway. The Panthers got the winning goal 10:37 into the period thanks to some perseverance. After Hall foiled two Trevor McKinnon shots from within 15 feet, Jared McKinley fought his way to a rebound and poked it just over the goal line. The game was particularly impressive since Summit City came in with only four defensemen and then one of them, Bryce Hower, got a 10-minute misconduct for charging. “We were 85-90 percent on the penalty kill all year and I told them (late in the game), ‘if you guys do your job, we have a 90 percent chance to win this game.' And they did,” said Schrock, a former Komets captain. A state title for the Panthers (12-22-1) probably didn’t look too likely when they lost 11 of their first 14 games. Homestead finished 15-24-0.